СDifficult oxide of magnesium and aluminium of MgAl2O4. Mohs hardness 8, brilliance is glass. 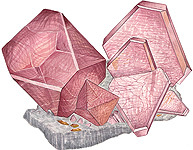 Be found mainly in form octahedral and dodecahedral crystals (other simple forms are rare) usually small sizes. Sometimes crystals Spinel are united in Druses. A color is very various - from colourless to black. The size of crystals is usually small, mass does not exceed 10-12 carat. Carat a measure of the weight of precious stones, esp diamonds. It was formerly defined as 3.17 grains, but the international carat is now standardized as 0.20 grams (5 carat = 1 grams). However there are large crystals. For Spinel the glass off-gloss is characteristic. Jeweller are the followings varieties: ruby Spinel (of the ruby type) - red; bale-ruby - rose-red; almandine Spinel (of the almandine type) - violet-red; rubicille - orange-red, yellow; sapphire Spinel (of the sapphire type) - dark blue, blue, cyan, sky; chlorospinel - brightly green; pleonaste, ceylonite pleonaste - dark-green; hanospinel - dark blue. 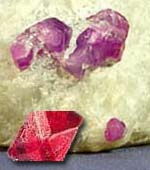 Most known and studied Spinel of rose and red color. In antiquity bright red Spinel did not distinguish from a ruby (coloured by the chrome of oxide of aluminium of Al2O3) and from Garnet-pyrope - by a carbuncle ancient could be any of these three stone. Cut Spinel is able as though to shine at dark. Red lale (Spinel of the ruby type), transparent and clean, a ruby reminds, sometimes excels him on beauty and brilliance, but yields to him on hardness: worn away in corners and ribs. Some of famous rubies red Spinel appeared on a check. Spinel of high quality is a dear enough jeweller stone, possessing strong brilliance at any illumination. At artificial or insufficient illumination dark Spinel can look gloomy dark sombre; solemn, and the light as though shine from within. Spinel Corundum reminds in a great deal. 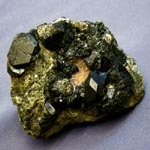 As well as Corundum, on composition it is an oxide, but not only aluminium, and aluminium and magnesium - MgAl3O4. As colourless absolutely clean Corundum, colourless, watery- transparent unalloyed Spinel. Although it also, as colourless Corundum, a diamond reminds, differs from him complete absence of game of stone after cutting. As well as ruby, paints the ruby Spinel admixture of chrome. 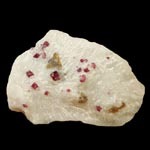 In deposits Spinel is frequent спутником of ruby. Authentication a large value has Spinel, especially from near of the cut stone resemblance with a ruby. To distinguish from him Spinel, as well as from other alike stone, it is possible on a form crystals, to more high brilliance in cutting, characteristic hardness, closeness and other physical properties. Diagnostics the best of all to charge Spinel an independent specialist. Spinel - one of jewels, known from deep antiquity. In antiquity Spinel attributed to the carbuncles (to the red stone). On territory of the CIS there is a mountain of lale stone on Pamire ("Great Mountains, the World Roof is a Foot of the Death Decease"). Here in the middle of IX century "Badahshane lale stone obtained" (the ancient name Spinel). About these age-old "ruby mines" mentioned in XIII century Easily soiled Hollow, which wrote, that this wonderful stone "balash" obtained in the district of Badahshane. According to legend, exactly lale stone decorated the cap of Monomahe originally. Two famous Spinel cuttings-in in the Britannic crown: "Ruby of the Black Prince" - polished stone length 5 sm - and "Ruby Timur" - by mass a 361 carat, with the intagliated on a stone names of his proprietors, one of the first this stone conqueror Tamerlan (Timur) owned, from here and his name. Largest standard rose Spinel by mass in 5,1 kg was found in 1985 on mountain Pamire by the Tadjikistan geologists. Basic source of jeweller Spinel is mineral deposits. 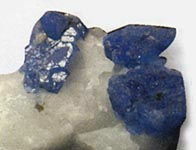 In the CIS deposit Spinel, known yet from XIII in., present on the south-west of Pamire mountains - Kukhilal. Large mine deposits Spinel are in Burma, Sri Lanka, Kampuchea, Thailand, less on scales - in Afghanistan, India, Australia, Madagascar. Spinel process with the use of the diamond or step cutting. Asterism Spinel (stone with a star) is cabochoning. 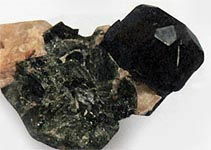 At treatment it is necessary to show a large carefulness in connection with large fragility Spinel. 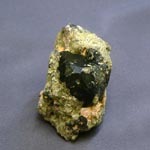 Most the color of stone is valued in Spinel. The dearest is red Spinel, further the rose goes and violet Spinel. Black Spinel interesting. Lowest price on Spinel of grey-dark blue color. Spinel of different color is synthesized. It is used not only as an analogue natural but also as an imitation of many jeweller stone. Synthetic Spinel imitates other jewels above all things, but not itself. Presently to purchase synthetic Spinel as an insertion in wares in jeweller shops practically unreal. Decorations with noble Spinel it is recommended to carry in a gold frame. This jewels color stones is the talisman of love, cleanness, loyalty and devotion, and also promotes to love of carnal. It is considered that ruby Spinel is necessary to be hidden from teenagers, because his main magic property - erotically to excite, give traction to the debauch. This stone, as sages supposed, develops sexual temperament in a people (especially red). Spinel of red color is considered on the East powerful stimulator of sexual energy, love and passion. Exactly they behaved to those stone which name Spinel now. It was considered that they had ability to excite irresistible passion. These stone feed people a life-breath, concentrate their longing, giving them happy possibility to feel itself on a moment by youths. Spinel of any color can even help a proprietor to turn a fate, elevate a people, lift from the insignificant state or clean and revive falling, waving on itself a hand. Bilious and spiteful people must not even touch to the stone, because it simply hates such, and, coming in fury (such touches offend stone! ), can strongly, almost unrecoverably, to harm: Spinel changes a situation on the whole, but not some its private displays. Stone allows a proprietor to forecast the future. From excessive impulsiveness of Spinel contra-indicated people.